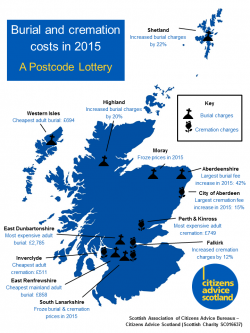 Costs for burials and cremations have increased in Scotland in 2015 while more people seek advice from their local CAB than ever before about paying for funerals. Burial charges have increased on average by 10% in 2015 when compared to 2014 levels. Cremation charges have increased on average by 5% in 2015 when compared to 2014 levels.